Dr. Dwight H. Pate – D.M.D. P.A. From small enhancements to a complete smile make over, this can change your life. Sedative medications allow you to have dental treatments in a relaxed state of consciousness. If you are missing a single tooth or all of your teeth, dental implants may be right for you. Welcome…to our world of beautiful healthy smiles! We are serving the citizens of Lakeland, Winter Haven and Auburndale and surrounding Polk County, Florida communities. Your smile communicates confidence and quality to everyone you come in contact with. Your smile can be predictably transformed by our dentist into one of health, confidence and comfort with a simple visit to our Polk County dentist office.At the Family Dentists Clinic in Auburndale, Dr. Dwight H. Pate D.M.D., P.A. can help you have the attractive smile and healthy teeth you have always dreamed of! Explore our website to see how the professional dental services of Dr. Pate in Polk County, FL can help make this happen for you! Then contact us for an appointment. Choosing a dentist is an important decision. Dr. 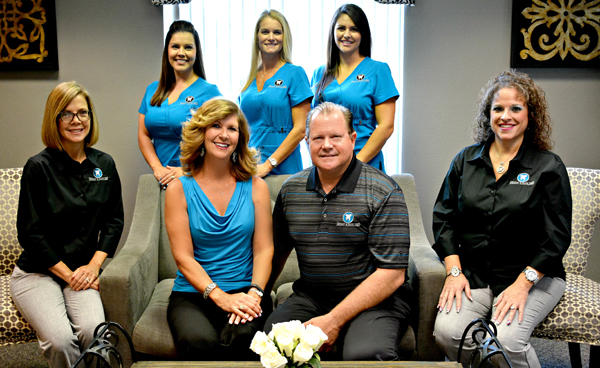 Pate and the staff have a passion for dentistry that is second to none. We focus on your needs, wants, and desires in formulating treatment plans and goals. Our outstanding credentials combined with an honest, patient-oriented approach are just two of the reasons many people trust us to care for themselves and their family and friends. These videos showcase some of these attributes. Take a look at what others have said about our office. We have a very professional, caring and motivated staff to help make your visit comfortable and informative. Our primary focus centers on listening to you and trying to understand your heartfelt wants, needs and desires. From the moment you call or visit our office, you will see and feel evidence of this every step of the way. Our team of experienced, highly trained and friendly professionals strives to make you feel relaxed and comfortable with your visit. We are eager to answer any questions regarding your dental care. Please feel free to share with us your needs and concerns. When it comes to Family Dentists, Dr. Pate’s gentle approach to Dentistry, is a comforting solution to your dental problems. With the focus on a very high level of quality control and technology, Dr. Pate’s Office is the Dental Clinic of the future, but it is here today. Esthetic dentistry is an art form! Take a look – seeing is believing! Dr. Pate will take the same care with you that he has with these smiling patients!